Population ageing and rising public health care spending are increasingly becoming issues of concern throughout the world, forcing governments into reforming public healthcare services. Sharing comparable standards of healthcare services and similar tax-based healthcare systems, the Nordic region and Hong Kong can be good partners in many areas, including preventive, curative and elderly care services as well as in revolutionary health-tech and the growing need to re-structure health service delivery. Moreover, building on its solid foundation in medical research and education, Hong Kong can be a research and development partner with Nordic countries in cutting-edge medicine. 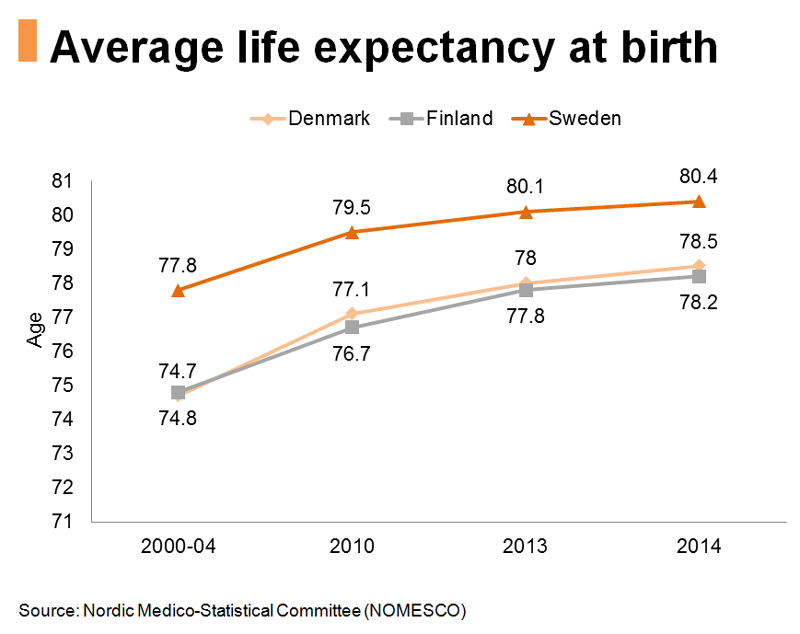 With an average life expectancy at birth of about 80 years and an infant mortality rate among the lowest in the world, the Nordic region leads in many healthcare practices and is renowned for its universalism, human touch and service-oriented approach. Financed almost completely by taxation (e.g. national, regional and local taxes), which is relatively high compared to other European economies (maximum individual income tax rate can be more than 60%) or through statutory health insurance schemes, nearly all hospitals are publicly owned and managed. Nordic residents are given free access to most health services, while patients are required to pay for pharmaceuticals and some special treatment up to limit. As a result, government expenditure on healthcare services has been rising in the Nordics, especially in Sweden. 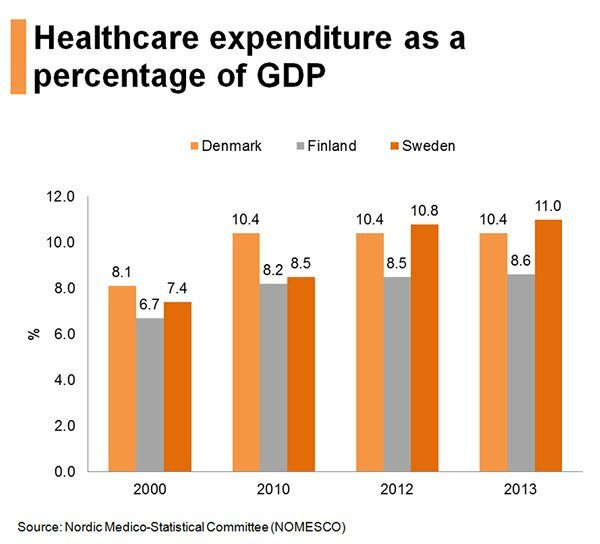 All the Nordic countries have established systems of primary healthcare in which every patient, except for emergency, needs to go through general medical practitioner services before being admitted to a hospital or referred for specialist treatment (usually offered outside hospitals). This drives patients through the hospital system more quickly to cut waiting times, while reducing unnecessary hospital stay and serves to relieve the ever-increasing state and municipal budgetary pressures. Systems of preventive care, such as preventive occupational health services and preventive services for mothers and infants have also been widely applied. 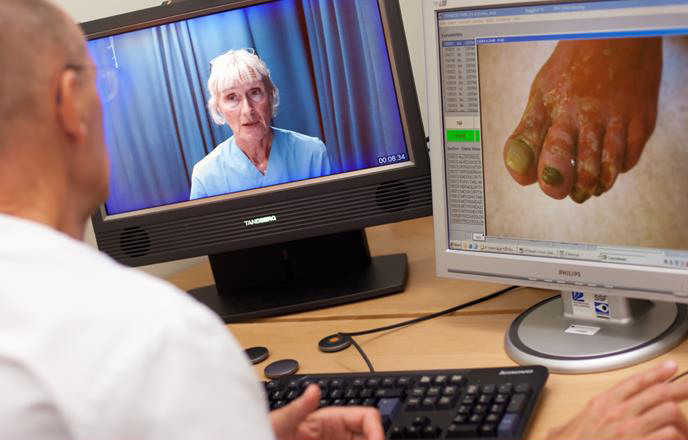 As a world-leading region for innovation and technology, Nordic countries are also forerunners in e-Health, which promotes electronic communication between patients and the healthcare system. 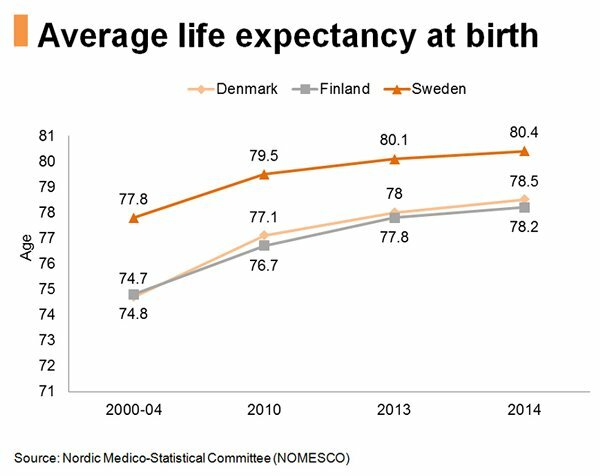 Nordic countries in general have a very good infrastructure that can facilitate the provision of e-Health services even in the rural areas, thanks to their highly developed information and communications technology infrastructure, high smartphone penetration and e‐mature population. Take the county of Västerbotten in the north of Sweden as an example. e-Health services are well established in the county, which has a separate Accelerator Control Network (ACNET) that provides all the different healthcare-related institutions with fast access to medical records and high-speed transfer of images and videos between different users. This saves both the doctors’ and the patients’ time and travel costs and at the same time provide its residents with a higher quality care at reduced cost. Among the e-Health services provided by the Västerbotten County Council are home monitoring of physiological parameters, such as electrocardiogram (ECG), lung functions, oxygen saturation and readings of pulse and blood pressure with portable health monitoring equipment; remote speech therapy for patients who suffer from speech, reading and language disorders; and hospital-to-hospital tele-medical consultation services via electronic stethoscopes for child patients with functional heart murmurs. Open to working with local and global partners, Nordic countries are constantly looking for new systems or models to meet their new healthcare challenges. Characterised by its fast-acting leadership, the Västerbotten County Council has been keen on engaging global healthcare players to take part in its bold vision to have the best health and the soundest population in the world by 2020. Unlike conventional public-private cooperation projects where private companies usually participate only as service providers, Västerbotten is seeking to engage private sector players as partners or co-owners of the project. As a ground-breaking cooperation model featuring a public-private partnership in the healthcare sector in the Nordics, two private partners, namely Philips (healthcare equipment) and Roche (diagnostics and pharmaceuticals) are running pilot projects in Västerbotten to understand how the public and private sector can work together to develop a long-term, self-financed investment framework for healthcare services. 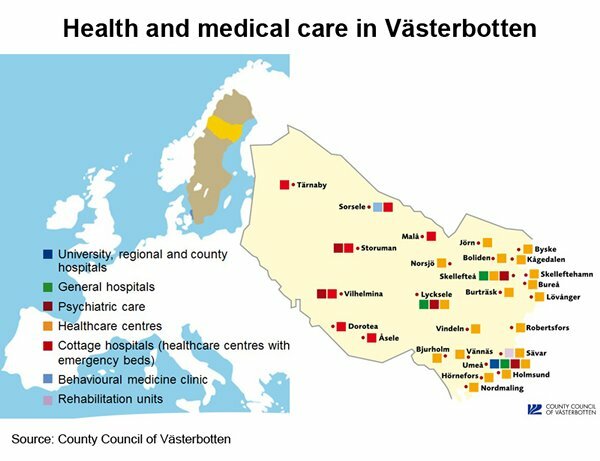 Under the partnership, the two private companies will provide Västerbotten County Council with consultancy services for new, tailor-made solutions, equipment and technology required to revamp the existing healthcare system with an aim of reducing the County’s overall cost of healthcare (which accounts approximately for 80% of its budget) by reducing stays in hospitals and visits to clinics, improving care experiences and reducing staff sick leave, while getting paid through a reimbursement scheme. Meanwhile, the Västerbotten County Council will provide the two private partners with a real-world environment, including a number of operating hospitals and primary care units, to test their new solutions and services which are capable of application elsewhere. For instance, various tests and studies have been carried out in an existing hospital in Umeå, the capital of the County, for a pilot project of a new psychiatric clinic with physical environment enhancement. Although the healthcare system in Hong Kong runs on a more dual-track basis than the Nordics, encompassing the public and the private sectors, the city offers equitable access to healthcare services at highly subsidised rates. Hong Kong faces similar compounding challenges of ageing population, rising expectations and escalating medical costs. There is therefore vast room for cooperation between Hong Kong and the Nordic countries in public healthcare services delivery, e-Health application and other innovative medical solutions. In order to address the sustainability problems within the public sector, both Hong Kong and the Nordic countries have been striving to enhance public-private partnerships (PPPs) and shorten waiting times, among a whole plethora of other promises. To this end, Hong Kong can make reference to some pioneering PPPs in the Nordics (e.g. the Västerbotten County Council) and see how different private healthcare players, such as medical equipment suppliers and pharmaceuticals/diagnostics companies, can be engaged in the revamp of the public healthcare system. How these exportable cooperation experiences can be further adjusted and applied to different socio-demographic environments elsewhere can also be explored. Given the healthcare policy reforms and the enormous growth in purchasing power, Chinese consumers’ demand for higher-quality healthcare has been ever increasing. The growing health awareness together with the increasing affordability calls for more and better medical services. To tap the vast opportunities of the burgeoning healthcare market in the Chinese mainland, Nordic companies can establish businesses in Hong Kong and work with Hong Kong hospitals and clinics to leverage on the liberalisation measures under CEPA, while taking advantage of the city’s long-standing ties with manufacturers and distributors in the Chinese mainland. In the run-up to any modern health care reform, medical technology companies are focusing more than ever on products that deliver cheaper, faster, more efficient patient care. For instance, China’s 13th Five-Year Plan calls for the development of robots for surgery, medical imaging technology, wearable devices and equipment for traditional Chinese medicine. Yet these innovative medical advances constantly increase prices and burden government funds with regular upgrades and renewals. While there is no simple way to solve this problem, the academic and business communities in Hong Kong and the Nordics can forge closer collaboration in medical research and development. This can better facilitate the commercialisation, transfer and licensing of research results and home-grown healthcare innovations to give Hong Kong’s consumers and public sector a wider choice of competitive options. Built on a solid foundation in medical research and education, Hong Kong’s medical cluster is no stranger to Nordic healthcare players, not to mention the renewed popularity created by the opening of the first overseas research centre of the prestigious Swedish medical university, the Karolinska Institutet, in February 2015. This new research centre not only enables Hong Kong’s leading team of medical experts and their foreign counterparts to collaborate on cutting-edge areas of research on the frontiers of medicine, such as the search for a Parkinson’s disease cure with stem cell technology, but also lays a foundation for other dynamic Hong Kong-Nordic cooperation in fields of healthcare, such as HealthTech. Hong Kong, as a financial centre and an entrepreneurial city, is keen on developing a thriving start-up ecosystem to promote innovation and technology. Leveraging the AIA Accelerator, Asia’s first HealthTech Accelerator programme, innovation accelerators such as Nest  have been more active in providing seed capital and expertise to HealthTech startups in Hong Kong. 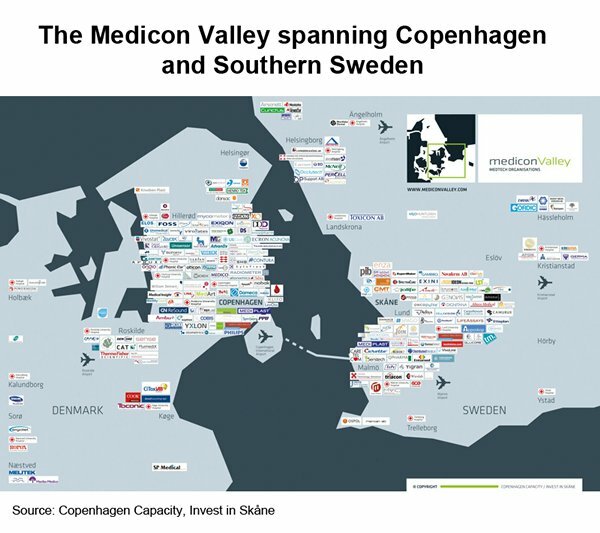 Also, Nordic life science clusters such as HealthBIO in Finland and Medicon Valley, jointly branded by Copenhagen Capacity  and Swedish counterpart Invest in Skåne in 1997 with the aim of becoming the most attractive ‘bio-region’ in Europe, are actively looking for investment and partnership opportunities from Hong Kong and Asian healthcare equipment manufacturers and HealthTech developers. By working closely with Nordic healthcare start-ups and helping them find partners and clients from the Chinese mainland, Hong Kong can be an ideal enabler of Sino/Asian-Nordic HealthTech application and collaboration. Meanwhile, Hong Kong can be an disinterested risk controller, assisting Nordic HealthTech companies in screening prospective investors from the Chinese mainland and other parts of Asia. Copenhagen Capacity is the official organisation for investment promotion and economic development in the Greater Copenhagen Region.